Featuring six brightly coloured marine creatures - hammerhead shark, white shark, octopus, piranha, deep sea fish and tropical fish - the Bloco Marine Creatures set is one of the superb products from the award winning Bloco Toys. These part 3D puzzle, part construction toys are distributed in the UK by Maps Toys. As with all Bloco kits, the high density foam and plastic connectors are a joy to use - and kids can either follow the included instruction sheets or 'go it alone' and come up with their own crazy inventions! This safe, easily manipulated and washable construction toy has been given the thumbs up by thousands of parents. The soft foam pieces have a lovely texture and no sharp edges. With a wide range of other sets available (including dinosaurs, dragons, insects and wildcats) the construction fun can last for ages! 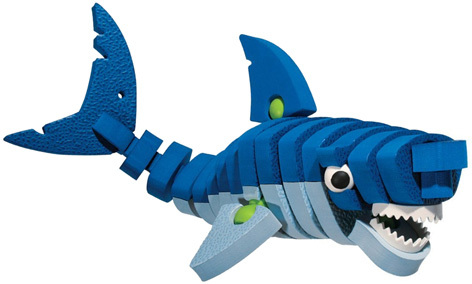 The Marine Creatures set from Bloco Toys comes with no fewer than 253 seperate pieces which can also be combined with the pieces of other sets to expand the possibilities even further. Bloco toys are suitable for children aged 5 years and over. 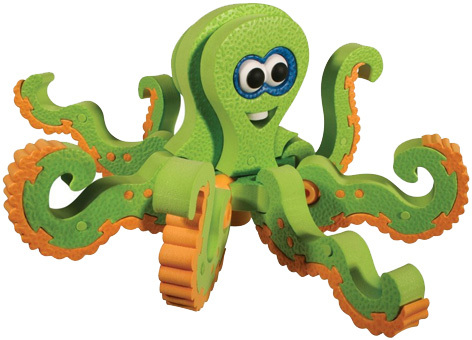 Please tell us what you think of the Bloco Marine Creatures Toys by Bloco and Maps Toys. I used these toys with a 3 year old and don't know who had greater pleasure... the 61 year old or the 3 year old! I bought one of these for a friend (adult) who loves marine life. She was made up! They are fun and funky to look at, gorgeously bright and colourful. I was impressed with the jigsaw element which would delight children as they try to slot the right pieces together. As a science teacher I also think it is a great toy to open up discussion along a wide range of topics (why animals are certain colours, what makes it swim, why it has many legs, how it eats etc), so very educational. I will definitely consider one of these for my daughter but she may have to fight me for it!